The apsides refer to the farthest (1) and nearest (2) points reached by an orbiting planetary body (1 and 2) with respect to a primary, or host, body (3). For example, the Moon's two apsides are the farthest point, apogee, and the nearest point, perigee, of its orbit around the host Earth. The Earth's two apsides are the farthest point, aphelion, and the nearest point, perihelion, of its orbit around the host Sun. The terms aphelion and perihelion apply in the same way to the orbits of Jupiter and the other planets, the comets, and the asteroids of the solar system. 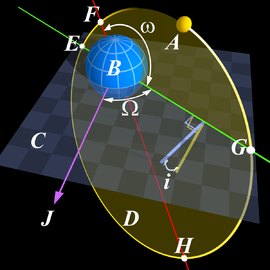 The two-body system of interacting elliptic orbits: The smaller, satellite body (blue) orbits the primary body (yellow); both are in elliptic orbits around their common center of mass (or barycenter), (red +). ∗Periapsis and apoapsis as distances: The smallest and largest distances between the orbiter and its host body. Apsis (Greek: ἁψίς; plural apsides /ˈæpsɪdiːz/, Greek: ἁψῖδες; "orbit") denotes either of the two extreme points—ie, the farthest or nearest point—in the orbit of a planetary body about its primary body (or simply, "the primary"). The plural term, "apsides", usually implies both apsis points (i.e., farthest and nearest). For example, the apsides of Earth's orbit of the Sun are two: the apsis for Earth's farthest point from the Sun, dubbed the aphelion; and the apsis for Earth's nearest point, the perihelion (see top figure). (The term "apsis", a cognate with apse, comes via Latin from Greek, there denoting a whole orbit). According to Newton's laws of motion all periodic orbits are ellipses, including: 1) the single orbital ellipse, where the primary body is fixed at one focus point and the planetary body orbits around that focus (see top figure); and 2) the two-body system of interacting elliptic orbits: both bodies orbit their joint center of mass (or barycenter), which is located at a focus point that is common to both ellipses, (see second figure). When used as a suffix—that is, -apsis—the term can refer to the two distances from the primary body to the orbiting body when the latter is located: 1) at the periapsis point, or 2) at the apoapsis point (compare both graphics, second figure). The line of apsides denotes the distance of the line that joins the nearest and farthest points across an orbit (see third figure). For generic situations where the primary is not specified, the terms pericenter and apocenter are used for naming the extreme points of orbits (see table, top figure); periapsis and apoapsis (or apapsis) are equivalent alternatives, but these terms, frequently, also refer to distances—that is, the smallest and largest distances between the orbiter and its host body, (see second figure). For a body orbiting the Sun, the point of least distance is the perihelion (/ˌpɛrɪˈhiːliən/), and the point of greatest distance is the aphelion (/æpˈhiːliən/); when discussing orbits around other stars the terms become periastron and apastron. When discussing a satellite of Earth, including the Moon, the point of least distance is the perigee (/ˈpɛrɪdʒiː/), and of greatest distance, the apogee, (from Ancient Greek: Γῆ (Gē), "land" or "earth"). There are no natural satellites of the Moon. For man-made objects in lunar orbit, the point of least distance may be called the pericynthion (/ˌpɛrɪˈsɪnθiən/) and the greatest distance the apocynthion (/ˌæpəˈsɪnθiən/); or perilune and apolune are sometimes used. The words perihelion and aphelion were coined by Johannes Kepler to describe the orbital motions of the planets around the Sun. The words are formed from the prefixes peri- (Greek: περί, near) and apo- (Greek: ἀπό, away from), affixed to the Greek word for the sun, (ἥλιος, or hēlíou). Various related terms are used for other celestial objects. The suffixes -gee, -helion, -astron and -galacticon are frequently used in the astronomical literature when referring to the Earth, Sun, stars, and the galactic center respectively. The suffix -jove is occasionally used for Jupiter, but -saturnium has very rarely been used in the last 50 years for Saturn. The -gee form is also used as a generic closest-approach-to any "planet" term instead of applying it only to Earth. During the Apollo program, the terms pericynthion and apocynthion were used when referring to orbiting the Moon; they reference Cynthia, an alternative name for the Greek Moon goddess Artemis. Regarding black holes, the terms perimelasma and apomelasma (from a Greek root) were used by physicist and science-fiction author Geoffrey A. Landis in a 1998 story, before perinigricon and aponigricon (from Latin) appeared in the scientific literature in 2002, as well as peribothron (from Greek bothros, meaning hole or pit) in 2015. The suffixes shown below may be added to prefixes peri- or apo- to form unique names of apsides for the orbiting bodies of the indicated host/(primary) system. However, only for the Earth and Sun systems are the unique suffixes commonly used. Typically, for other host systems the generic suffix, -apsis, is used instead. [not in citation given]. The chart shows the extreme range (of the varying distance from the Sun) of the indicated planet, dwarf planet (including Ceres), or Halley's Comet, of the Solar System. This is the line of apsides of the orbit of a object around its host body. (The 'thickness' of vertical line, or 'length' of horizontal bar, correspond to the extreme range of the orbit of each object).